Summer is in full swing in Dallas, TX and with the long holiday weekend, I am seriously vibing some kite flying. Have you ever flown one before? It’s so much fun! 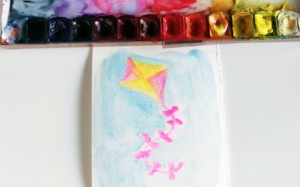 Of course I had to sketch a watercolor kite for this week’s Color Snack Sunday. It’s another super easy, quick and FUN tutorial that you can try on your long holiday break! Wooho!! Step 1. Glaze your watercolor paper. This can be a little tricky, but with enough practice you will get the hang of it. It is important to make sure that the watercolor paper is properly wet, but not dripping with water. Otherwise it will not create a cool effect, but rather be super drippy. Start by adding a thin layer first and then add more if you feel that it is not properly wet. Alternatively, if you have *too* much water – you can use a paper towel or tissue to soak some of it back up and off the watercolor paper. Step 2. Start sketching the rhombus shape that makes up the body of the kite. I am using one of my favorite colors, Opera Pink by Daniel Smith, but any fun or bright color will work here. Step 3. Sketch the Kite Tail. Sketch cross lines insides the kite and then sketch a wavy tail. Step 4. Sketch the kite tail ribbons. Step 5.Fill in the background. I am using Cerulean Blue by Daniel Smith because it’s a perfect shade of blue for a summer sky. The colors will bleed a little into each other, but that is kind of the point: to give this sketch a summery and airy feel. Step 6. 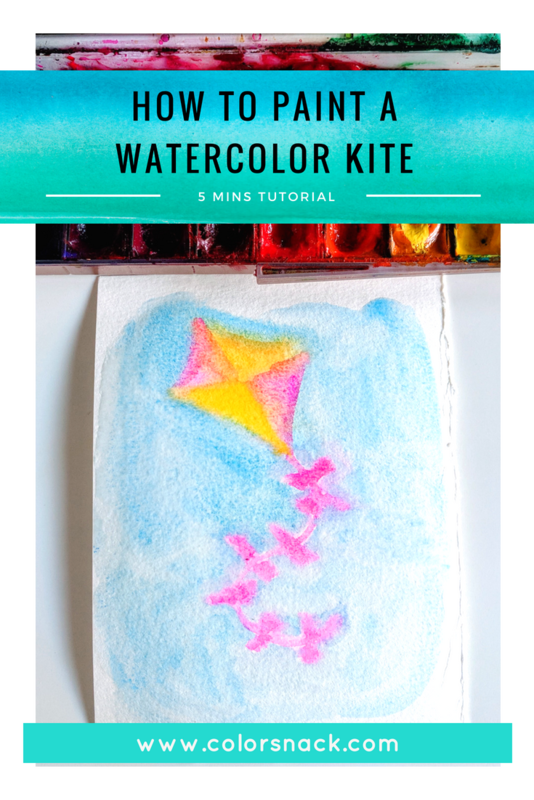 Go over your sketch with an additional layer of color to give your kite more dimension. Your eggplant sketch is ready! You can also check out the full video for this tutorial to see it in action.